Grace Episcopal Day School is a Christian based, family-oriented educational community dedicated to maximizing each student’s potential. 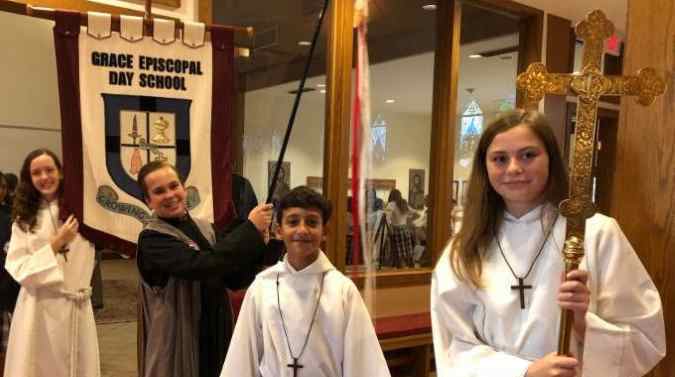 The spiritual identity of Grace Episcopal Day School is grounded in the Christian faith and expressed through the liturgy and tradition of the Episcopal Church. As an Episcopal school, we integrate spiritual formation into all aspects of the educational experience. As stated by the National Association of Episcopal Schools, we share the belief that our mission is built on the sure foundation of a Christian love that guides and challenges all who attend our schools to build lives of genuine meaning, purpose, and service in the world they will inherit. We believe in the basic principles of the Baptismal Covenant and honor, celebrate, and worship God as the center of life. At Grace Episcopal Day School, we strive for justice and peace among all people and respect the dignity of every human being. Grace Episcopal Day School integrates varied teaching methods with traditional approaches to inspire learning and build confidence. Teachers are given the freedom to teach in their own unique learning styles and children are encouraged to learn through relevant experiences and hands-on learning. At Grace Episcopal Day School we celebrate the richness of life in a Christ-centered community, the seriousness of academic achievement, and the joy of childhood.